It was the details we loved, the furnishings and fine-tunings of the individual houses. The bathroom was one of the great rooms for exploration of style—from the get go, people chose their appliances to show off their wealth and sophistication. When the outhouse (or Necessary, as it was known by those refined and euphemistic Victorians) was moved inside, it was an evolutionary process, open for interpretation, an approach we took as an open invitation to riff on. For the Seaview, we chose the relatively upscale detail of enclosing the tub in wood paneling that matched the wainscot trim around the walls. It also solved the problem of how to hide the craggy bottom of the tub Noel and a potter friend had slipcast from porcelain (Chrysnbon had yet to come out with their matchless, in-scale claw-foot plastic tubs, which we would learn to modify with paint so they looked more like porcelain). The wainscot we made from ¼” fir strips beveled on both sides on the Dremel scroll saw/sander (a days’-long, tedious process that still makes my back and ears ache to think of—but, hey, we were young!). We then glued and butted the strips together on sheets of newspaper, sanded, stained, steel-wooled and stained again until we got the color we liked. I cut the finished, laid-up strips into sections the height of a chair rail, glued them to the walls with Elmer’s, and capped them with similarly finished basswood chair railing. Noel was still proudly cutting our baseboards from fir, though that would change, once we discovered the time-saving wonders of Northeastern mouldings. Above the wainscoting the walls are papered in a textured, off-white paper with a decorative border around the top. The floors are the same stained oak as the rest of the second story. (Side-lining a moment–in an early interview we were quoted as saying Noel milled all our moldings, which was true until we discovered Northeastern, but the quote was printed, and stuck, and to this day we are trying to undo that mis-perception). The overall effect of the Seaview’s bathroom was, unsurprisingly, very close to the bathroom we had refinished in our own Seaview house, though the wainscot in the full-size version Noel made from plaster lath. And, in the case of our house, we got to have the porcelain clawfoot tub—a relic resurrected from its bucolic second life in a pasture as a livestock water trough. 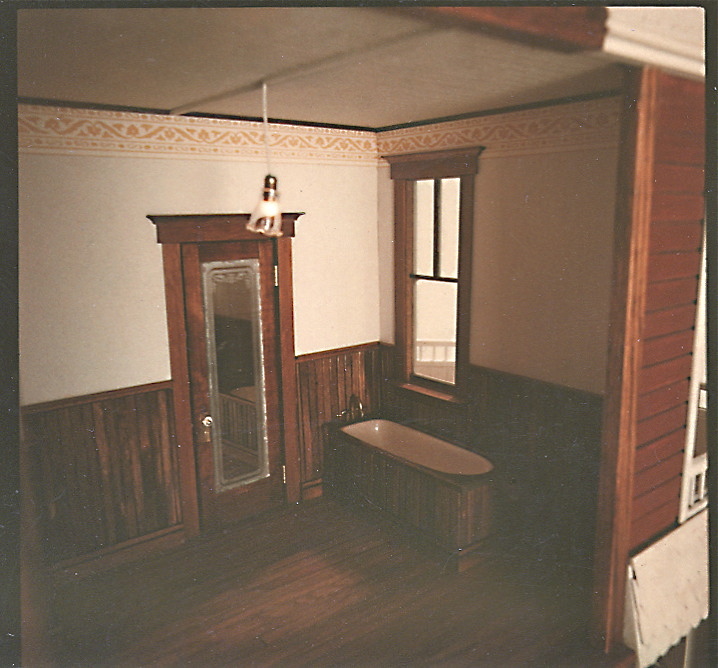 The tub was on the shortish side (to fit our tiny bathroom, carved out of the one-time back porch), so that when you slid down in for a soak, your feet were comfortably propped at the perfect angle for relaxing and forgetting all those hours at the sander. This entry was posted in Miniatures and tagged architecture, bathrooms. Bookmark the permalink.